Today a leader in the automotive repair industry, Y&S Auto Body Shop established its success through thirty years of consistent hard work and stable growth led by our Founder and President Mr. Younan Safar. 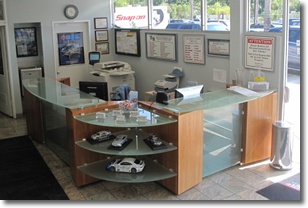 Mr. Safar has been the driving force behind the quality and ethical conduct that Y&S Auto Body Shop has become renowned for. An immigrant who came to this country with the spirit to build his dream at the age of seventeen, he worked forty years from a grinding bodyman position in New York to become an outstanding icon in the South Bay. During its’ humble beginning as a single bay body shop in the South Bay, the reputation of Y&S grew with each vehicle repair. With no compromises in quality to meet Mr. Safar’s only way to complete a job to his satisfaction; remaining our way today of returning vehicles to prior accident condition, can only be matched by vehicle manufacturers end product when new. That is why Y&S workmanship and paint finishes carry a lifetime warrantee. This level of quality has never been compromised and today our technicians are continuously educated advancing their knowledge of repair techniques demanded by the latest technologies. In addition, certified through OEM training by Mercedes Benz, Jaguar, Volvo, Toyota and Ford, Y&S technicians are provided with critical knowledge ultimately contributing to the incomparable quality our company delivers. Y&S is an operation standing on a concrete foundation with a proven track record resulting in strategic operation expansions. Y&S Headquarters in San Pedro is considered to be home base for all operations, team member training, testing center, and all major business decisions. We have operated and own this 77,000 square foot facility since 1988. By 1997 the facility was drawing in customers from far beyond the South Bay. Before long our relationship with a row of dealerships on Pacific Coast Highway in Torrance, including Mercedes Benz, Jaguar, Volvo, Toyota and Ford, provided an opportunity to open a brand new state-of-the-art facility on Crenshaw Boulevard in Torrance. It was a turn-key situation enabling Y&S to provide rapid turnaround services to the dealers, while capturing new customers and accounts searching for reliable high quality repairs. By simply following the gravity of our growth pattern, our three locations sprouted up prime locations. Due to our increased exposure and convenience, our facilities successfully service residents of South Bay towns including Manhattan Beach; Redondo Beach; Palos Verdes; Palos Verdes Estates; Rancho Palos Verdes; Torrance; El Segundo; Lomita; Carson; Harbor City; Wilmington; San Pedro; Lawndale; Los Angeles; Rolling Hills; and Rolling Hills Estates. Y&S San Pedro has great exposure as it is at the hub that connects the only access to the south end of the 110 Freeway and the Vincent Thomas Bridge to Long Beach.